What are GREENGUARD and JPMA Certification’s and what do they mean for our baby? What they usually don’t know is that most of the products that they are using contain harmful chemicals. Many of these chemicals are known to be carcinogenic, and as we sleep through the night we are breathing in the off-gassing of these poisons. Now think of this…what is toxic to us is about FIFTEEN times more toxic to our itty bitty baby! As a culture we are moving toward healthier life standards. As the consumers demand for more sustainable, durable and healthier products continues to grow, suppliers must change to remain relevant. JPMA and GREENGUARD are both certifications that a product receives which shows the product has gone through specific rigorous testing that ensures a higher standard of product safety. In simple terms, a certification from GREENGUARD means the product in question has met some of the world’s most rigorous and comprehensive standards for low emissions of volatile organic compounds (VOCs) into indoor air. Indoor air quality (IAQ) is closely tied to health, and is therefore recognized as an important concern in homes, schools, healthcare environments and commercial spaces. Volatile organic compound (VOC) emissions from building materials and furnishings are a major source of indoor air pollution. GREENGUARD Certification has been widely adopted as a trusted standard for low-emitting products. In fact, more than 400 green building codes, standards, guidelines, procurements policies, and rating systems give credit for GREENGUARD Certified products (GREENGUARD, 2013). The GREENGUARD Gold standard includes health based criteria for additional chemicals and also requires lower total VOC emissions levels to ensure that products are acceptable for use in environments such as schools and healthcare facilities. In addition to limiting emissions of more than 360 VOCs and total chemical emissions, GREENGUARD Gold Certified products must also comply with requirements of the State of California’s Department of Public Health “Standard Method for the Testing and Evaluation of Volatile Organic Chemical Emissions from Indoor Sources Using Environmental Chambers, Version 1.1 (2010)” (also known as California Section 01350) (GREENGUARD, 2013). JPMA is a Certification Seal on a product which tells the consumers the product has been verified as conforming to the requirements established by ASTM (American Society for Testing and Materials), through independent laboratory testing and follow-up on-site inspection of the manufacturer’s production line. The JPMA currently sponsors 20 certification programs for juvenile products such as cribs, strollers, car seats, bedding and a wide range of accessories and decorative items (Intertek, 2013). As a national trade organization, it represents 95 percent of the prenatal to preschool market, translating to 250 companies across the United States, Canada and Mexico (Intertek, 2013). Lung Disease and breathing problems are the number one cause of infant deaths who are under the age of one, according to the American Lung Association. The reason for this is pretty simple. The airways of babies are small and can easily shut down when inflamed. They also breathe more times per minute than adults do which in turn means that they breathe in more toxins then adults do. Volatile organic compounds (VOCs) are organic chemicals that have a high vapor pressure at ordinary room temperature. Their high vapor pressure results from a low boiling point, which causes large numbers of molecules to evaporate or sublimate from the liquid or solid form of the compound and enter the surrounding air. VOCs are numerous, varied, and ubiquitous. They include both human-made and naturally occurring chemical compounds. Most scents or odors are of VOCs. Some VOCs are dangerous to human health or cause harm to the environment. Since people today spend most of their time at home or in an office, long-term exposure to VOCs in the indoor environment can contribute to Sick Building Syndrome (Wang, et al., 2007). Studies also show that relative leukemia and lymphoma can increase through prolonged exposure of VOCs in the indoor environment (Irigaray, et al., 2007). Aside from giving them all the love and care in the world- the next best thing we can do for our children is to provide a safe and healthy environment in which they can grow. Creating a healthy nursery and maintaining a healthier space for our baby requires some research and taking a good hard look at our indoor environment. What all of this means is that when we are building and furnishing the living areas for our children, we need to pay extra attention to keeping out chemical and biological pollutants. Here are some easy and helpful tips from Kids Only Furniture. 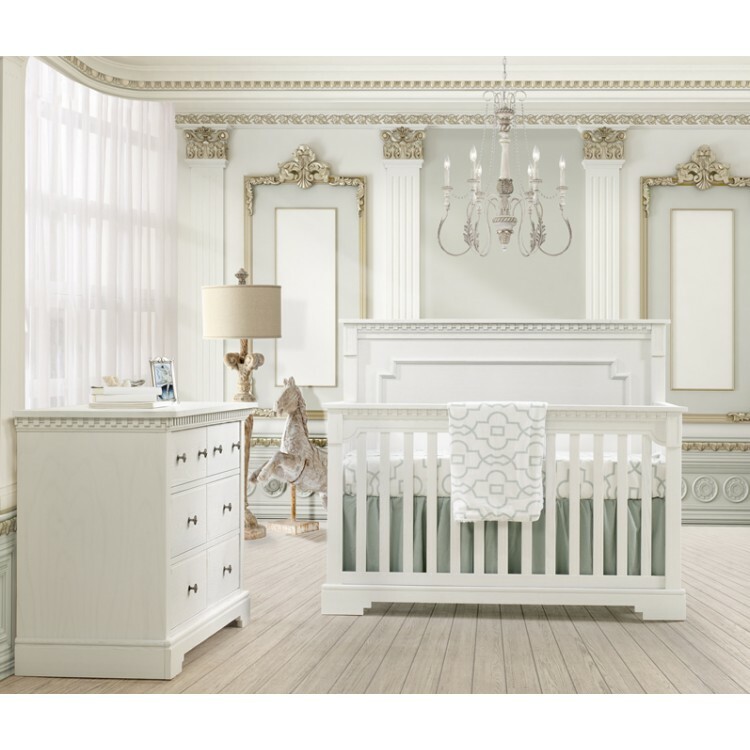 The best choice for children’s furniture is solid wood with a low-VOC finish. Some good brands to look for are Natart, Baby Appleseed, New Port Cottages, and Romina. However, if your budget is limiting you to pressed-wood products, do not worry! You can contain most of the VOC’s by sealing any of the exposed edges. The same idea goes for your baby’s closets and shelves, seal what you can. Try your best to avoid window treatments or blinds made with PVC. When picking things for your children that are made of plastic use common sense and trust your nose. If it smells like plastic, then it probably shouldn’t be around your child. The harder the plastic the better it is, as the softer ones are more likely to contain harmful chemicals. Any paint, paintings, decorations or adhesives should be checked to make sure they have low VOC’s. Try to avoid using vinyl. When covering your walls try your best to use paper materials and check the adhesive for low VOC’s. If low VOC’s can’t be avoided in the adhesive, make sure it is thoroughly dry and the room has been aired out before the baby sleeps in the room. As far as flooring, try not to use synthetic wall-to-wall carpets. They can gather dust mites and mold and they emit VOC’s. Linoleum, wood and tile are better choices. You can make them more comfortable and child friendly by using washable wool or cotton throw rugs.